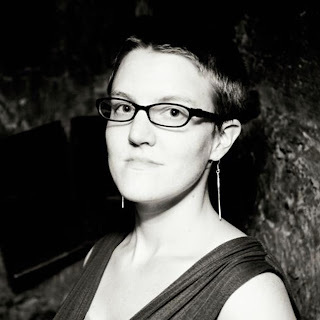 Extra-Curricular Interests: Improv, biking, blogging, bikram yoga-ing, contra dancing, stand-up comedy, and quiet time. What artists are currently in heavy rotation on your iPod? : WQED. I love Gregorian chants, too. If you could bring two things with you to a deserted island, what would they be? : If it's a vacation situation, a hammock and a friend to snuggle. If it's a shipwreck situation, a hatchet and a friend to snuggle. If you could have dinner with one person from history, who would it be and why? : The Buddha, to ask if he could pass the salt. One more thing we should know about you: I've been volunteering at the Mattress Factory since 2007, and it has been RAD! Visiting the Mattress Factory Museum's New Exhibitions! 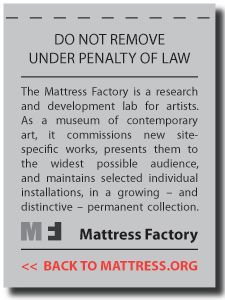 This is an exciting time at the Mattress Factory! If you haven’t visited in a while, there’s a lot of great new work to see: THREE brand new exhibitions across three buildings, and all included in your museum admission! That’s a pretty good deal don’t you think? To sweeten the deal, I wanted to share my thoughts on the new exhibitions to give you an idea of what to expect when you visit. The first thing you will notice when you come to the Mattress Factory is a large brown creature in the parking lot. That Godzilla-sized chupacabra is actually a really big prehistoric sloth, a found object installed by artist Scott Hocking, one of nine artists participating in the museum’s residency program. It welcomes visitors coming to the main building to see the show Detroit: Artists in Residence. Your friendly Visitor Services Coordinator, Maria, will welcome you to the museum, take your admission, and suggest you start on the 4th floor and work your way down. So grab your handouts, affix your museum tab to your collar, and head up to 4. As you step out of the elevator on the 4th floor and let the doors close behind you, pause and listen; you’ll notice a variety of mingling sounds from each of the four new Detroit installations. You’ll hear a faint murmuring of voices and music from the hanging cans in Jessica Freylinghuysen’s My City is Your City, the chiming of clocks, bells, and excerpts of Stravinsky’s Rite of Spring from Frank Pahl’s 1913 Revisited in Three Parts, the ominous clanging and buzzing of power tools in Nicola Kuperus & AdamLee Miller’s Diptyching, and, more subtly, the occasional clicks of heaters and electronic devices transforming wind turbine and solar power into heat that warms the Michigan picture rocks in Design 99’s Following the Sun 2. Sound is what linked these pieces for me. On the third floor you turn to your left from the elevator to see Cured by Russ Orlando. A blue-lit room enshrines auto parts encrusted in salt, hanging silently from shiny new meat hooks. In contrast to the 4th floor, this room is quiet. Dead quiet, except for the stray pieces of salt that crunch between the soles of your shoes and the white tile of the floor. Scott Hocking’s Coronal Mass Ejection is in the Mattress Factory’s lower level, a space known for it’s original cellar-like stone walls. You’ll see more of the quirky figures and beasts similar to the sloth you saw in the parking lot: a pyramid of biblical-looking figures in the back of the room, dinosaur heads hanging from the walls, and a hot metal train car, also called a torpedo car, rests like the sunken Titanic in the middle of the floor. If you’re super sure nobody is looking, do you think you might be able to climb the ladder and look into the torpedo car itself for a better look? If you feel adventurous, and nobody is looking, you should go exploring. When you’ve finished seeing the Detroit show and head back to the lobby, Maria will check in with you to see how you’re doing and tell you how to get to the annex gallery at 1414 Monterey to see Janine Antoni’s solo show Within. 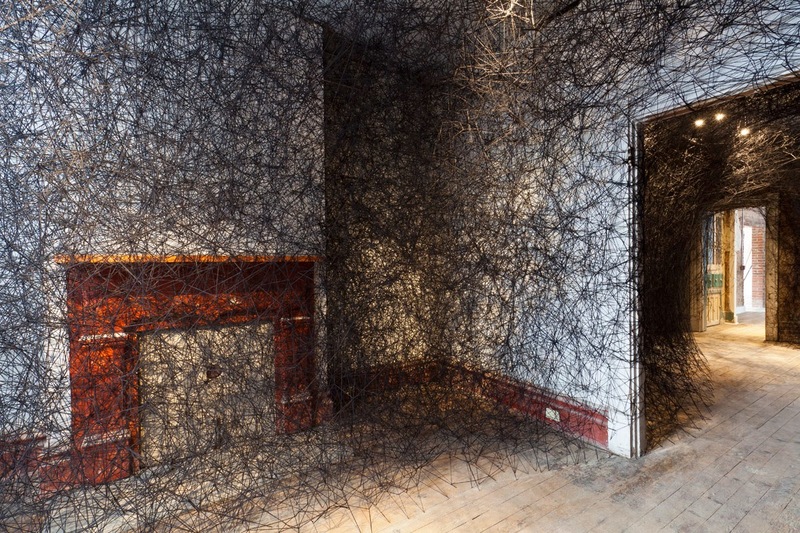 What interests me most about Janine’s installation is her use of vast amounts of beautiful empty space. The entrance features a completely empty room leading towards a massive tree trunk and root system that has been split in half--one half on the floor, the other half floating into the ceiling. What you will discover upstairs is that the tree passes completely through the ceiling and up through the floor to become part of the table holding curious cast resin body parts and bones in Graft. Hip bones appear in several of Antoni’s installations in the building, so be on the lookout: hip bones are what shaped the raku fired bowls in Gertrude, Margaret, and Mary, and what may seem like an unused room has a bigger surprise for those who are patient and take a moment to consider the space in Crowned. You may find yourself wanting to sit for an extended period of time watching Honey Baby, a collaboration with choreographer Stephen Petronio. That’s ok; it’s what the bench is for! 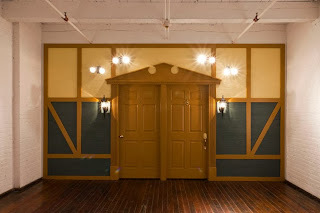 First of all, this building is amazing, and I think this new installation is a lovely compliment to the previous installation at this site before the building was renovated. The previous installation, In the Dwelling-House, artist Ruth Stanford researched the previous inhabitants of the house and installed tombstone-like memorials in the windows listing each family members’ names and occupations. 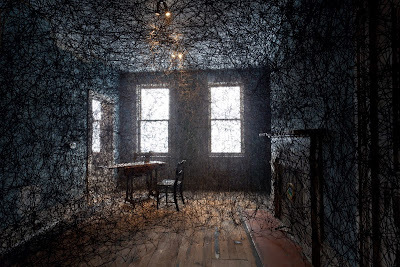 Similar to Stanford’s work, the webs in Trace of Memory gives form to the unseen memories of this house. Every room is a cocoon of black yarn suspending different objects in each room – a desk, a pile of books, old suitcases, chairs, a wedding dress, a single pristine white bed. Exploring this house reminded me of the heroine in Jane Austen’s Northanger Abbey; I felt like Catherine exploring the abbey and wondering excitedly if it was haunted, if there were any secret passageways I could discover, and what really happened in this house so long ago? In my quest, I discovered a storage closet, the bathroom, and some quirky dead-ends that you’ll always find in a fabulous old house. Every ambient sound made my hair stand on end; was that just another visitor walking around upstairs, or a ghost? I could have walked forever through that building; the presence that exists in those spaces where Shiota has woven her webs is truly haunting. 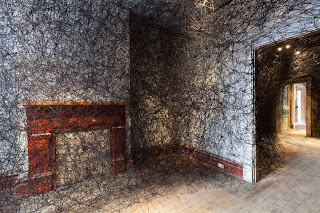 For me, installation art is unique because it is experiential. Everyone’s experience will be different, and what activates the artwork is your participation. 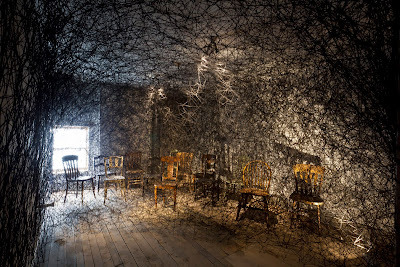 When you go to an installation art museum, you’re not going to just see the artwork. You are going to complete the artwork by interacting with it. I think of it as a collaboration with the artist. When you think of yourself as a collaborator with the artist, that immediately makes your participation important and relevant. And I think that’s awesome! So, fellow potential collaborators, I’ve shared my experience of the new exhibitions; now I want to hear about yours. 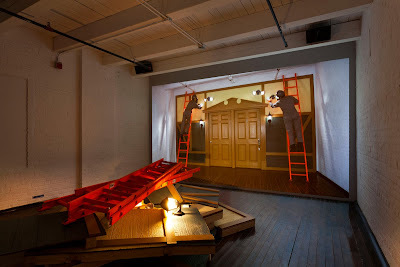 Come visit the Mattress Factory and get a chance to be a part of this great new work in Pittsburgh, and let me know what you think by e-mailing me at eduintern@mattress.org! 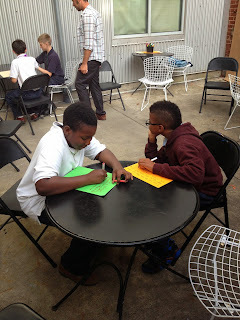 And stay tuned to special events coming up including ARTLabs, performances, and other educational opportunities. October 19th ARTLab: BEWARE! Haunted Factory Inside! KEEP OUT! What makes a place scary? In our next ARTLab we’ll be taking inspiration from Nicola Kuperus and Adam Lee Miller’s Diptyching and create our own scary and usettling spaces. 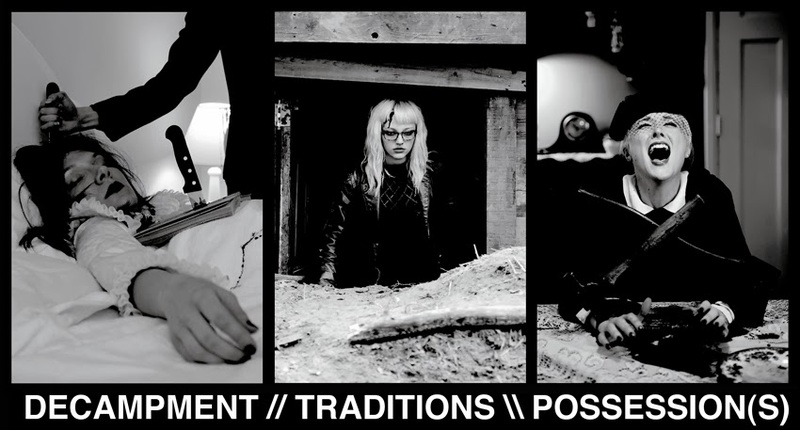 ArtLab is free with your museum admission, and we encourage all to participate… IF YOU DARE. Since 1997, Kuperus and Miller have been recording and performing music videos under the band name ADULT., often performing a live soundtrack alongside their films. For their work at the Mattress Factory, their process started first with composing the music. 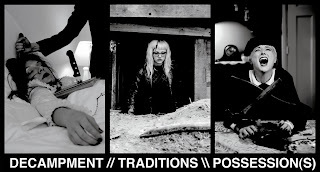 Much of the inspiration for the installation came directly from Pittsburgh: the artists recognize Pittsburgh as a place with some of the best haunted houses, the façade design is taken from a house the artists saw in Troy Hill during their stay in Pittsburgh, and the horror effects in the video are a nod to the work of George Romero, famous for filming such cult horror classics as Dawn of the Dead in the greater Pittsburgh area. The artists used techniques from Tom Savini’s book Grand Illusions for the horror effects seen in their video. The artists wanted to create a piece that embraced the two poles of ridiculousness and seriousness, comedy and tragedy. As a result, Diptyching is a space that elicits multiple contrasting feelings. It is welcoming and familiar yet foreboding and unsettling. The motion-sensor spotlights may feel accusatory when they snap on as you walk up close. The pristine tudor-style façade is almost too perfect in contrast to the screams and construction sounds coming from inside. 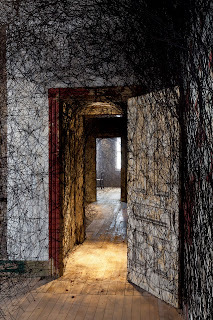 When you walk in, the door slams and locks behind you, corralling you and forcing you to walk through the space. The video embraces comedy and tragedy much like a cartoon; the construction worker characters bumble into construction mishaps, including bloody maimings, but the characters always reappear for the next bit, including the oldest joke in the book: the dangers of the misplaced banana peel. Depending on your constitution, you may find what you see hilarious, or you may find it gross or uncomfortable. So what makes a place creepy for you? Why do we like to be scared? Come to the Mattress Factory and experiment with other visitors on October 19th! And keep an eye on the calendar - there’s going to be a spooky movie and live musical performance by the artists on October 31st! There will be more details posted here soon! For 12 weeks, 3rd, 4th, and 5th graders from Pittsburgh Allegheny Traditional K-5 are spending their Wednesday afternoons at the Mattress Factory with artist Ben Sota of the Zany Umbrella Circus! 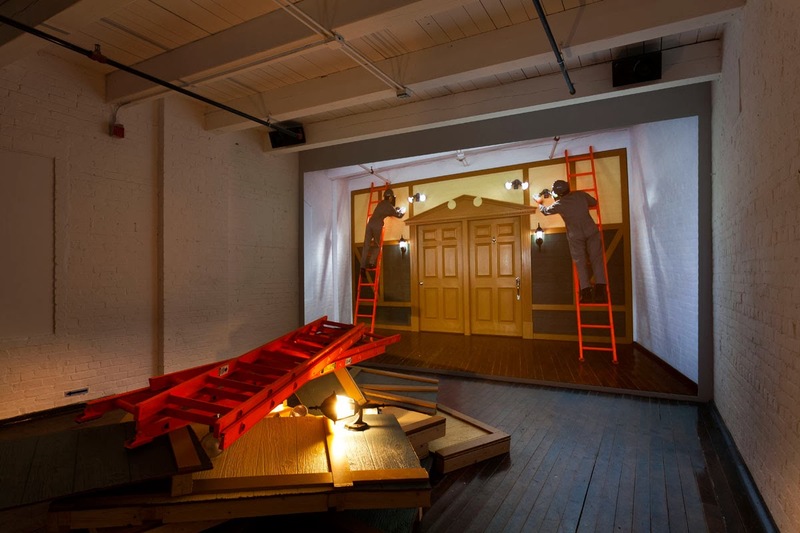 Install: Afternoons at the Factory, funded by the Keith Haring Foundation, is a continuation of the Mattress Factory’s Summer Community Art Labs. The students participating in this free after-school program will experience an intensive exploration of the galleries that goes beyond the scope of a regular afternoon field trip. 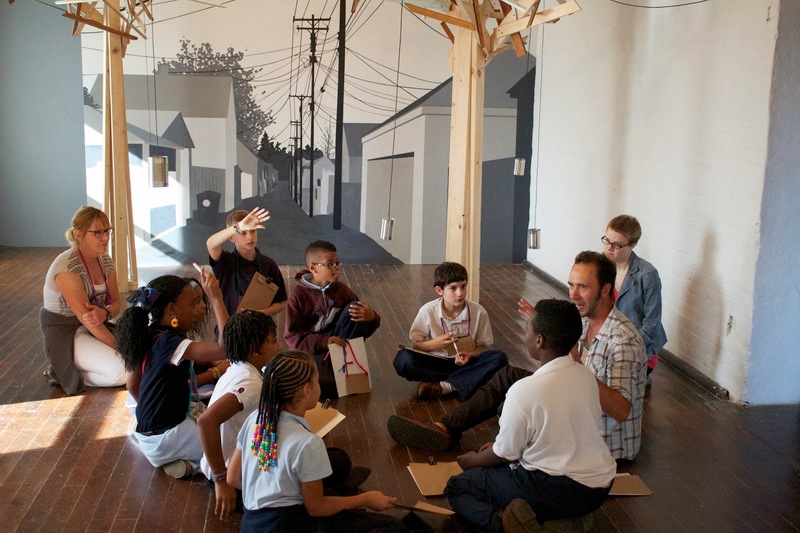 Led by Ben and Mattress Factory museum educators, students will engage in thoughtful discussion in the galleries that will inform collaborative art projects. Students will also spend some time completing their homework and enjoying some healthy snacks! Current special snack requests: pickles, pretzels, and pineapple. If you think their food tastes are pretty creative, then you should look forward to the art projects they create in the next few months! 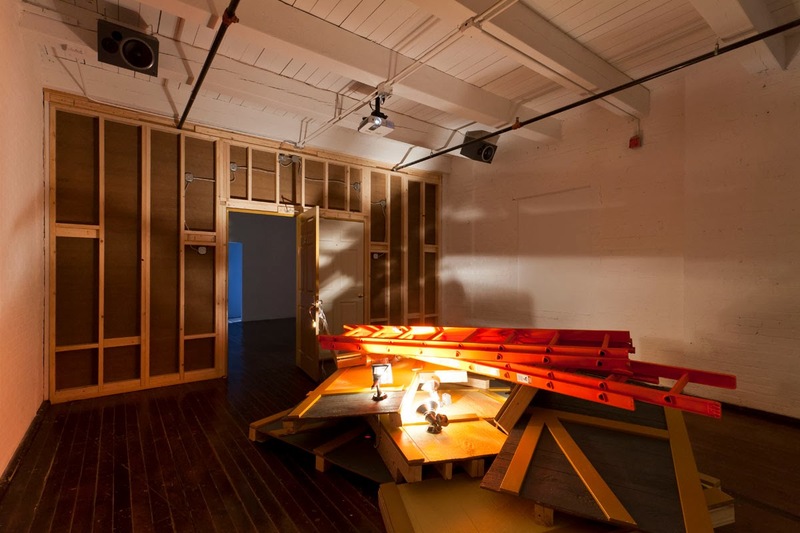 The education model at the Mattress Factory seeks to mirror the exhibition model of its resident artists: providing a lab for artists to experiment, take risks, and explore their own artistic practice. The result is site-specific work that connects the artists and their work to the neighborhood. 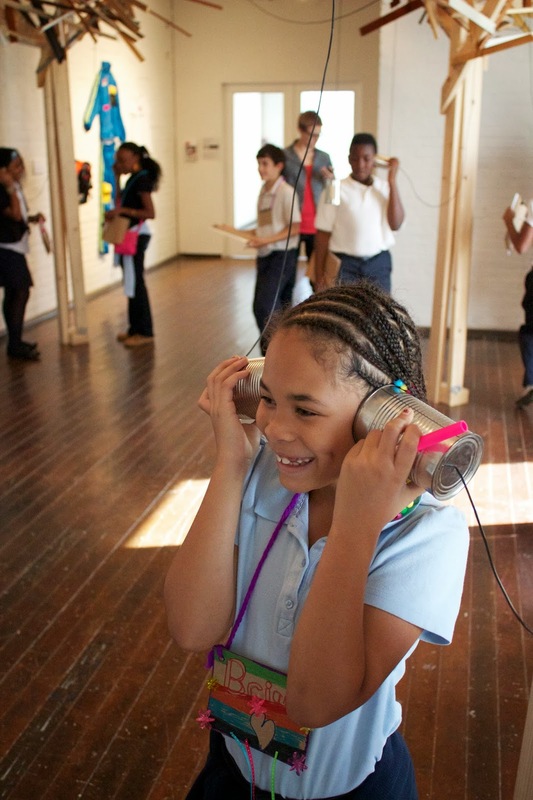 The after-school students, as residents of the neighborhood, get the chance to explore and engage directly with the museum, taking ownership of the institution as a community resource. The Mattress Factory Education Department hopes this program will help promote community engagement and showcase the unique education opportunities available to it’s North Side neighbors. We’re looking forward to what Ben and the Allegheny Traditional students create! Stay posted to find out about other Educational Opportunities. Feel free to be in touch with our Director of Education at Felice@mattress.org for more information about our winter and spring after school programs or other educational opportunities.